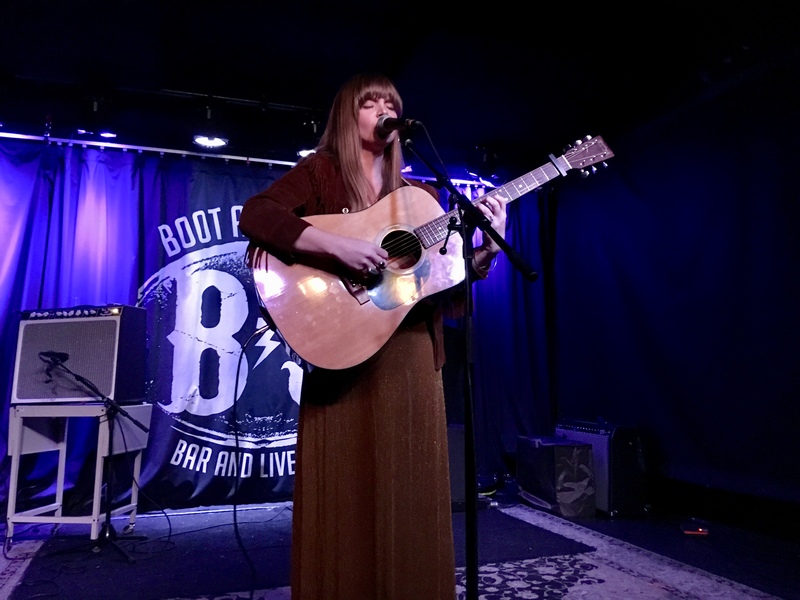 At the Boot & Saddle in South Philly last night, Courtney Marie Andrews delivered as magical and mesmerizing a set as I’ve witnessed during my 30+ years of concert-going. The 15 songs explored the highways, byways, colors and hues of heartbreak, heartache, life and death, and did so with deftness and charm. What blew me away as much as her lyrics and melodies: the clarity and power of her voice, which soars and swoops through the soul like no other. In between songs, while tuning her guitar (which was replete with new strings), she shared stories about their inspirations and, too, her life experiences, from writing “Heart and Mind” at a truck stop following the 2016 election to interacting with the colorful characters she met while tending bar for a time. “Honest Life,” she explained, was heard as a gospel song by Jools Holland, who asked to play it with her when she appeared on his Later show in England. The song, as does the Honest Life album as a whole, echoes the past while remaining rooted in the present; it’s an example of the amalgamation I referenced in my review, merging a myriad of influences into a unique and singular whole. It blows my mind every time I listen to it, in other words, and – live – it did so, again. Other highlights included her first “funny” song, which was charming and droll. 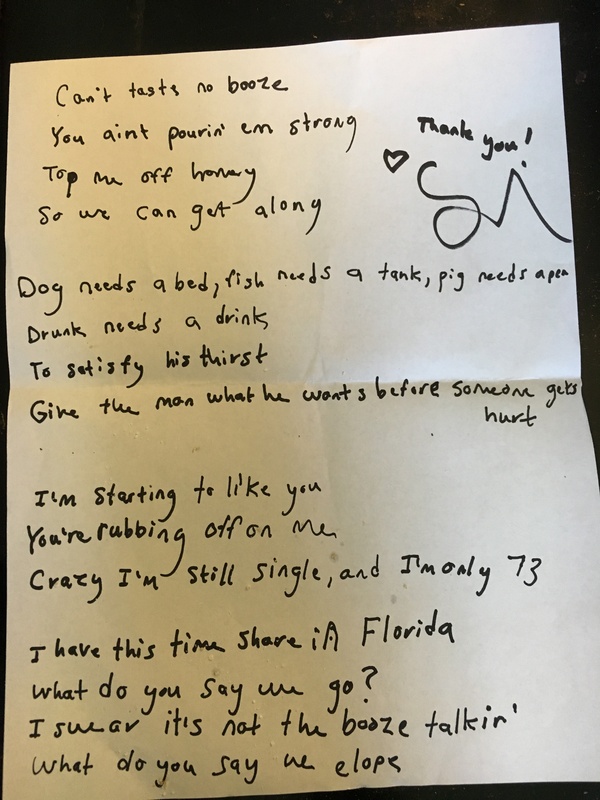 Some of the lyrics, as autographed by Courtney, are to the left. That was to be the night’s last song, but after cajoles from the crowd she debuted a song she’d yet to perform live – no title was given, but the chorus mentions a “Long, Long Road.” Like the night’s previous 14 songs, one can hear the clarion call of the generations in it, from the tunes mined by A.P. Carter in the Appalachian mountains to the folk-country stylings of First Aid Kit. Here’s the set – with a few caveats. She didn’t mention song titles, so the “funny song” and night’s final song have what I think they may be called in parentheses; I’m likely wrong. I also am not familiar with the moving song she sang for her aunt, who was diagnosed with Stage 4 lung cancer as she was writing it (she’s since rebounded and the cancer is nearly gone). Also: the Dove & the Wolf, who opened, were simply magnificent. We’re looking forward to seeing them again. 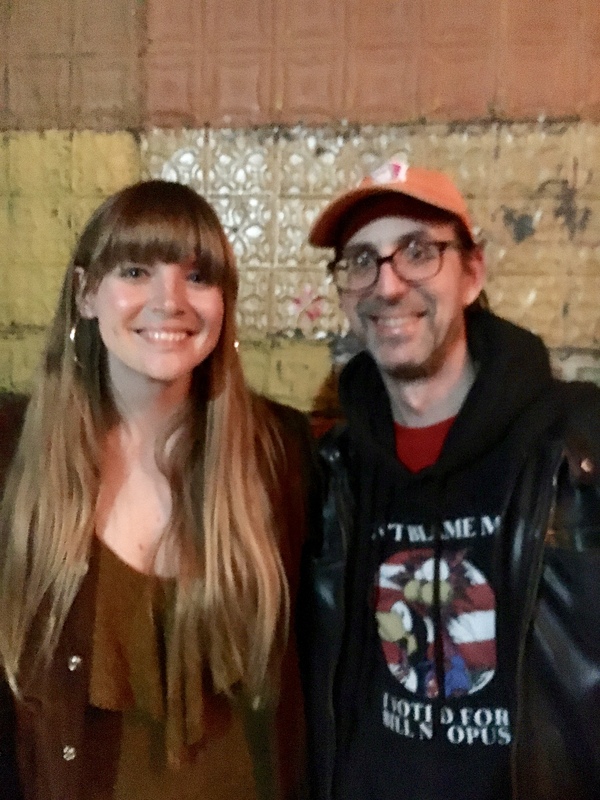 And, last: Philly fans should note that Courtney will be back in town on November 2nd, when she opens for Hamilton Leithauser at the Union Transfer. Fantastic!! Thank you for this. She is one of the best singer songwriters I’ve heard in many many many years. omfg. thank you.